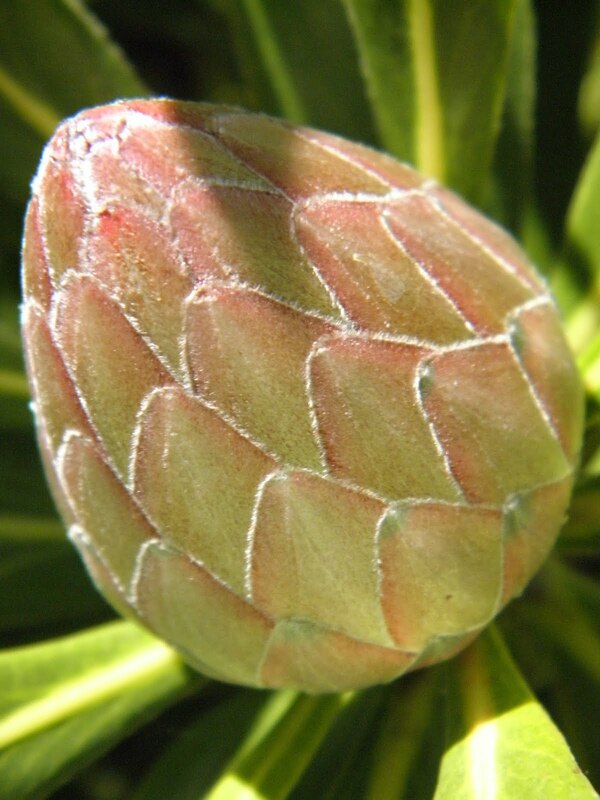 The Protea is an evergreen shrub and can reach heights of 8 to 10 feet. 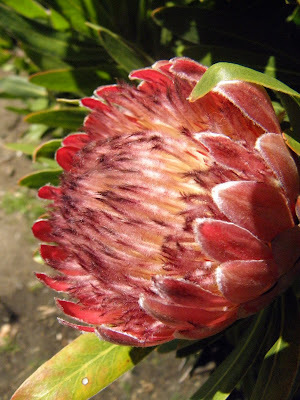 It needs full sun exposure and is in bloom right now in the San Francisco Botanical gardens. It blooms from late Spring through Summer. It originates in South Africa. I was so excited to see this plant/shrub in the South African gardens. It is incredible to witness up close and personal. As always, I gravitate to the South African garden for it's exotic flavor and colors. While there I shoot away like a snap happy shutterbug. I have always loved these flowers. Years ago, when I worked in surgery at Mt. Zion, one of the nurses was from South Africa and she was always gifting us with proteus...beautiful flowers. What a gorgeous shrub. I've never seen one of those. the blooms are incredible. Wow..Jo, these photos are stunning! I would be snapping away like mad if I were there too! Gorgeous macro shots! The texture is fantastic in these flower! 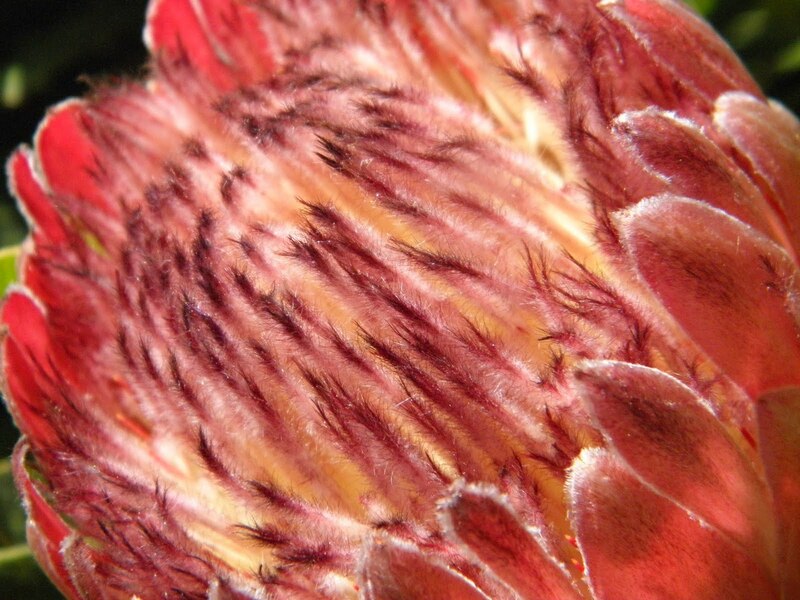 wow, i can almost feel the tiny hairs of the flowers, the details are fabulous Jo, your images are gorgeous. I once was given 2 of these but they were getting too big for the house so I gave them away. I love their blooms and the different colours that they come in. Must be wonderful having Botanic Gardens so close by to get such inspiration from and show us beautiful photos. I would like to see that exotic garden too, it must be very beautiful. This flower is is amazing. The texture of the bud has such a perfect geometry as it would be handmade. Thanks for sharing this beauty on Macro Flowers Saturday! Gorgeous and like Ann I've never seen one before. Thanks for showing it here. My mom had a couple of these, Dad refered to them as "your mother's weird plants". I think he liked them, though. Nice shots. looks exotic and one of a kind. you must have a blast taking photos of flowers in the garden. lucky you. Thanks so much to all of you for visiting and commenting. I always enjoy reading your thoughts and comments. How very beautiful. The second shot reminds me of an artichoke! I'm going to enter your contest... and I'm going to spread the word. What a lovely blog. CherylK, you are right, it does look like one :) I'm so happy you are entering the contest. I love for everyone to share their photos. Thanks for the kind words.